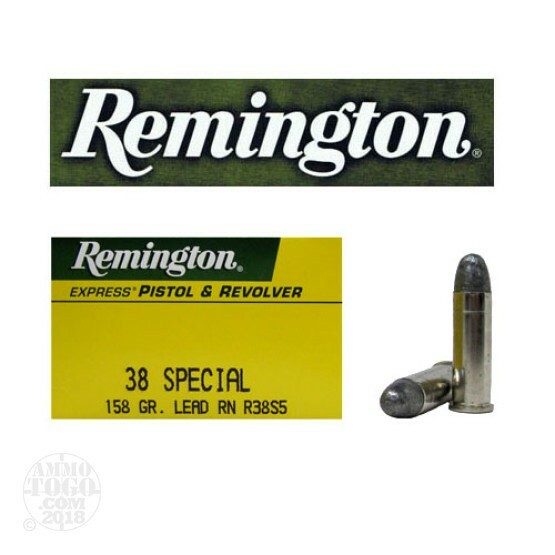 This is 38 Special Remington Express 158gr. Lead Round Nose Ammo. Remington Express centerfire pistol and revolver ammunition is precision manufactured, field proven and time tested for unsurpassed performance and reliability. This is premium ammunition at an affordable price. This ammo is brass cased - nickel coated, boxer primed, non-magnetic and non-corrosive. It comes packed in 50rd. boxes. Muzzle Velocity: 755 fps.